Microsoft Pays For Patents On Cell Phone Radiation Protection, But Won’t Use Them! Let’s keep this simple. What’s safer for your health is smarter, and smarter Smartphone technology is being held back by corporate giants fearful over claims that radiation from wireless devices will harm your health. Joanne Suder, a Baltimore-based plaintiff attorney, said “Dozens and dozens” of patents have been filed by the industry to create radiation-shielding technology. Nokia filed one of these patents on July 28, 1998, according to the U.S. patent office. The patent contains a description for the creation of a device that would protect the cells in a user’s head from radiation. Cleared to start court proceedings in 2015, Thirteen consumers have filed lawsuits in Washington D.C’s superior court that may shed light on the cell phone industry’s alleged cover-up regarding the dangers of exposure to cell phone radiation and may prove to be the start of a big wave of product liability litigation. Around the time of the proceedings, Nokia spokesman Keith Nowak dismissed the Nokia patent touted by Suder as a patent “on antenna efficiency,” not a disease-fighting tool. “The more efficiently the phone can work, the better” it is for the consumer, Nowak said. However, while Nokia makes these claims to the media, these claims aren’t what Nokia engineers wrote in describing the patent which make direct reference to health hazards and brain tumors. RCRwireless reported that, wireless consumer advocate Carl Hilliard will reveal that Nokia Corp., Motorola Inc. and L.M. Ericsson have received patents since the mid-1990s to reduce mobile-phone radiation. The new information, taken directly from patents, is expected to be introduced in various mobile-phone cancer lawsuits pursued by Hilliard, Baltimore lawyer Peter Angelos and others. 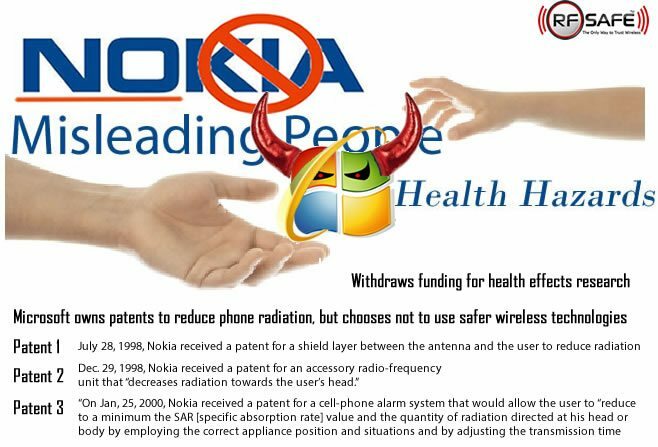 Nokia ties thier patented inventions directly to suspected health risks from cell phone radiation. Nokia received a patent for a shield layer between the antenna and the user to reduce the electromagnetic irradiation of the user. Earlier in 2014, after proof of biological changes in skin cells were observed “at below” what is now considered by the FCC as a safe level of radiation absorption — Nokia withheld health effects research funding from world renown scientist Dr Dariusz Leszczynski, Adjunct Professor, Division of Biochemistry and Biotechnology at the University of Helsinki and a member of a working group of 31 scientists from 14 countries constituted by the World Health Organization (WHO); which classified cell phone radiation as a group 2B carcinogen. Next article Let's Play Pong, Cell Phone Radiation Wars Have Begun - Consumers Win!